Days after HP launched its ultra-affordable Plus 7 tablet, Toshiba also decided to give it a try with its new Toshiba Excite Go. 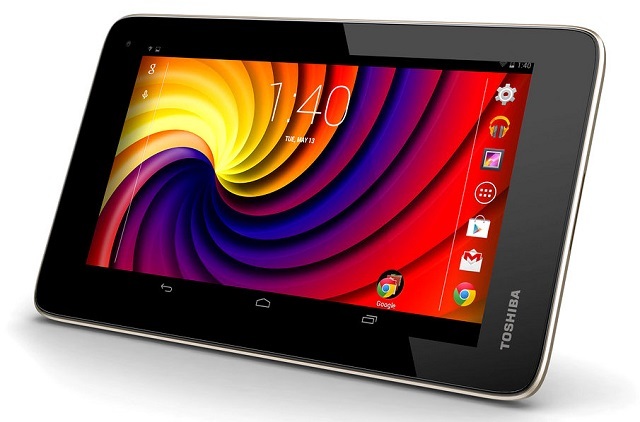 The Toshiba Excite Go is the company’s latest affordable offering in the Excite range of devices. The tablet has a 7 inch display with resolution of 1024 x 800 pixels. The device is powered by a quad core Intel Atom processor. The tablet runs on the latest Android KitKat version. While most of the specs are unavailable, the device seems to have a front facing camera. The tablet is said to have a rear facing camera that is coupled with the TruCapture app with better image recognition in whiteboards. The device also comes bundled with the full version of OfficeSuite Pro worth $15. Toshiba promises up to 7.5 hours of battery life with average use and up to 6 hours of video playback. The tablet is priced at $109.99.